My Updown account was up 5.6% in July 2010 but the S&P 500 was up 6.9%. I was beat by the index by 1.3% this past month. In 2010 I'm up 5.6% and the S&P 500 is up 0.4%. So I'm a full 5% ahead of the index for the year to date. Since starting in March 2008 I'm up 8.4% while the S&P 500 is down 17.2%. I didn't make any trades last month. However I had a stake in FRE which was delisted which forced a sale at $0.34. I had bought it at $1.20 with the speculation that it would go up a bit. That didn't work out too well. Didn't milk used to cost like $1.50 a gallon or something? Now it seems milk is $3 a gallon. I think I remember spending 22¢ a pound on bananas and now they are like 70¢. Have food costs really doubled in the past 10 years or so?? Am I just remembering prices wrong? Or worse yet, I turning into an old man before my time by waxing nostalgic about how "In my day, candy bars used to cost a quarter!!". I decided to take a look at real data on the price of foods over the past and get the truth of the matter. Here is a list of the foods, which year the BLS data starts at and the annual inflation from the start of the data up until 2010. I got the BLS data for the US City Average and I'm just looking at January prices just to make the math simpler. I'm assuming there isn't a lot of month to month volatility in prices or if there is its just due to temporary conditions like bad weather causing a drought or something. The foods in question have been going up at inflation rates in the 0.6% to 3.4% range. 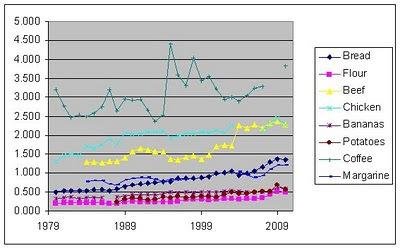 From 1981 to 2010 food prices as a whole increased at an inflation rate of 3.0%. The overall inflation rate (CPI) in that same time period from '81 to 2010 was 3.2%. Gaps are due to data missing for certain years from the BLS information. Most of the food prices I looked at increased in price fairly steadily at an upward gradual increase over the years. But the price of coffee was pretty volatile with it jumping up and down by large %'s from year to year. More often than not the prices goes up or down by more than 6%. The price jumped drastically from 1994 to 1995. I did a quick google search and found a reference in a book 'South America, Central America and the Caribbean 2003' that said: "In June and July 1994 coffee prices escalated sharply, following reports that as much as 50% of the 1995/96 Brazilian crop had been damaged by frosts" There you go, a bad crop caused the price to jump. Generally the cost of the commodity food items I looked at have had relatively mild inflation over the past 3 decades in the range of 0.6% to 3.9%. Individual food items may go up at a rate slightly higher or lower than foods in general or CPI, but the long term inflation of foods I looked at are within 1% of the general CPI. Keep in mind this is just a sample of 8 foods and other foods have behaved differently. This weekend my wife and I bought a Topsy Turvy tomato planter . The purchase was pretty much a whim. My sister had introduced us to the product over July 4th when we were visiting her. My wife has been interested in doing some gardening at home. Then we ran across a display of Topsy Turvy planters at our local grocery store for 50% off. Buying a Topsy Turvy planter seemed like a good idea. I'm not sure if it really was a good idea or not. The only way to know first hand if it was a good purchase will be to try it. I figured I'd make it an experiment and document our experiences and results in a series of posts. Is the Topsy Turvy a worthwhile product?? Is growing tomatoes with a Topsy Turvy a good investment in time and money? To determine if the Topsy Turvy is a good product I'll make a personal judgment based on my experiences with it. The answer to this question will be my personal opinion and based on my sum of experiences with the product at the end of summer. To answer the second question I'll figure out how much money we saved versus buying tomatoes and evaluate if that savings is worth the cost of the Topsy Turvy and other materials and our time investment. Organic tomatoes cost $2.50 to $5.00 per pound depending on the variety. Note: This is not a scientific experiment at all. To do a better experiment I should really also have a tomato planted traditionally in the ground. My wife and I are novice gardeners so we may kill the plant due to our own mistakes. We bought the Topsy Turvy at the store. When we got home we opened it up and read the instructions and quickly realized we needed to make another trip to the store for potting soil, fertilizer and tomato seedling. Needing to buy the soil and seedling seems obvious in hindsight but I guess we weren't thinking about it when we bought the Topsy Turvy initially. I didn't know exactly how it worked and didn't read the package too well. (obviously this purchase was not well planned... it was definitely bought on a whim). So anyway we ran back to the store and bought some soil, fertilizer and a tomato plant. The Topsy Turvy itself was on sale for $7. I think we spent around $8 on the bag of soil, about $3 on the plant and another $5 on the soil. Our total cost is about $23. The $8 on the bag of soil and $5 on fertilizer was for a lot more product than we need for one tomato plant. A small bag of potting soil wouldn't have been enough soil and we bought the smallest quantity of fertilizer they had. The labor put into the Topsy Turvy so far was mostly at the store and a few minutes to actually plant the tomato plant into the planter. I would estimate that we've put about 1 hour of effort into it so far. The end result is one young tomato plant hanging in our back yard (pictured at left). If you're interested in a longer more detailed experiment that assessed the savings of planting a garden then check out The Year-Long GRS Project: How Much Does a Garden Really Save? from Get Rich Slowly. I borrowed the idea for my experiment from GRS, but my own experiment is on a much smaller scale. Bargaineering discusses a The Five Minute Rule for investing. Its a pretty good rule. Are you having a tough choice between "following your passion" or choosing a career that will actually pay your bills? Well maybe you can have your cake and eat it two via a double major. I just read a post from Trent at Simple Dollar talking about his college and career choices in which he says: "I could have double-majored in a way that allowed me to follow my dream and still follow a lucrative path, too, if the dream didn’t work out." I think this is a great idea. If its not obvious what this means let me explain: Say you have a "passion" for music but you realize that musicians are often relatively low paid and that paying the bills can be a challenge. Instead of going to college and just getting a music degree why not get a double or dual major with music and another career option. The second half of your major should be something that you know will have a higher likelihood of providing you a decent paying job. You could combine your music with business, education, accounting, nursing or any number of other options. If you have a passion for something that is not very highly paid then simply find a second degree that is in a more lucrative field that you have a talent for and which appeals to you and combine the two in a dual/double degree. The two halves of your degree could compliment one another or they may have little to do with each other. A dual/double degree allows you to keep the door open to follow your passion while giving you a more lucrative and dependable career option as well. You can also combine the two degrees to open the door to career options that utilize both skills. I had a roommate in college who dual majored in music and engineering. He had a gift for playing the violin but he was practical enough to know it would be hard to make a good living at it. Getting the dual degree gave him a fall back option of working as an engineer but left the door open to a possible career in music. I actually think he did it to keep his parents happy yet still pursue his own interests. But what about the Extra time and work? Yes there is generally going to be extra time and effort involved in getting a dual/double major. Getting a dual/double degree isn't going to take 2 times as long as getting a single major. With some planning it shouldn't take more than a year or two extra. First of all your general requirements should be similar so you don't have to take English 101 two times. Its mainly just the courses in your major that will differ. You should probably be able to get a dual/double degree in 5-6 years. If you plan it out well and try to achieve the maximum amount of overlapping courses then you could squeeze it into 4.5-5 years. Two degrees makes you more marketable in general. When I show people my resume I have two degrees on it, one in engineering and the other in computer science. Having both degrees gives me a leg up in the job market over people with only one degree. Even if your two majors are quite different you can find an intersection where they will open more doors in different industries or jobs. For example if you have a music degree and a computer science degree then you could work in a purely music area, purely programming area or you could combine them and work as the music director in a video game. The other day I wrote "Investigating Side jobs and Alternate Incomes where I talked about how I'd like to find myself some other income streams. In a comment to that article a reader named Lola asked if I'd accounted for the impact on taxes, health insurance, and other benefits as a self employed person. If I were to ever quit my day job then I'd have to figure out how to handle taxes and replace some of the key benefits that my employer currently pays. Chief among those concerns in my mind is getting health insurance coverage for myself and my wife. I'd need to make sure that I could pay for health insurance out of pocket and budget for it appropriately. Unfortunately the cost of health insurance is a fast moving target and its been going up pretty quickly over the years. So it may be hard to plan for the cost long term. But we have to start somewhere and figuring out what coverage would cost today is step one. Over two years I budgeted an estimated $800 a month for health insurance. I'm afraid I don't remember exactly where I got that figure from. It may have been a quote off eHealthInsurance or it could have been a ballpark estimate. There isn't a single answer on how much health insurance costs. In fact the cost of health insurance depends on how much you want to spend on it. If I want a higher risk high deductible plan then I will spend less on health insurance, but if I want a plan that covers almost all the costs with little or no deductible then my monthly premium costs will be much higher. A key element in the cost of health insurance is determining how much coverage you want and how high of a deductible you are comfortable with. If you want to take on higher risk then you can get a lower monthly premium, but if you want to be confident all your costs are covered then your premiums will be higher. You also have to compare like plans and look for good value. Some plans are better than others no matter what, for example I wouldn't spend $20,000 a year on a plan with $0 deductible if I could get a $5000 deductible plan for $5000 in premiums. If two plans have the exact same deductible, co-insurance and other coverage details but one has a low premium monthly premium than the other then its lower cost. Determining how much health insurance costs you is a process of deciding what level of coverage you want and finding the best value to meet your needs. Note: The premium costs and terms mentioned below are just an example for my situation in my state. Your own situation is going to be unique and the rates may vary substantially in your state. To get an idea of health insurance options available to you, you can do a search on eHealthInsurance for yourself. I got quotes on eHealthInsurance for health insurance plans to cover my wife and myself. The search resulted in over 90 different options with a wide array of monthly premiums, deductibles, co-insurance percentages, total out of pocket maximum spending. Here are 4 options that covered the spectrum of choices which I've given nicknames of Cheapo, High Deduct, Health Savings and Low Deduct. If you look at just the monthly premiums then there is a huge range there between $1,500 a year all the way up to $6,000 a year. The 'Cheapo' plan has the lowest premiums at $125 a month but a very high deductible and high out of pocket maximum cost. The High Deduct plan has high deductible and out of pocket maximums but both are lower than Cheapo and the premiums are twice as expensive at $258 monthly. The Health Savings plan has a Health Saving Account (HSA) and while it has a $6,000 deductible that is the maximum you'll have to pay and also about the maximum you can deposit into an HSA for a family. The HSA plan's premium is $319 a month. The Low Deduct is closest to a traditional health insurance plan. It costs $500 a month but as a lower $2,000 deductible. If my wife and I never got sick or injured then the cheapo plan with the $125 monthly premium would be the cheapest option. But its extremely unlikely we'd be perfectly healthy forever. The Low Deduct plan has the lowest deductible but the highest fixed monthly premium costs. To compare the 4 plans I'll look at the minimum, medium and maximum costs you would incur for each based on spending scenarios reflecting the best case, medium and worst cases. The minimum cost is just the monthly premium x 12. That cost assumes we're both in perfect health with no additional out of pocket costs. The medium cost is assuming about $4,000 in additional medical costs so its the cost of $4,000 in spending plus the 12 month of premiums.. I don't know what our average annual health care spending is but I'm just arbitrarily picking $4,000 to represent the cost if one of us is injured or becomes ill in some way that isn't life threatening. The maximum cost is the most we could pay out of pocket in a given year. First of all I see that the Health Savings plan is cheaper than the Low Deduct plan in all 3 scenarios. So I would immediately cross the Low Deduct plan off the list since the HSA option is better overall. Now lets look at the High Deduct plan versus the Health Savings plan. In the min and med spending scenarios the High Deduct plan is $732 a year cheaper than the Health Savings plan. But in the max spending scenario we'd be spending $13,268 more with the high deductible plan. This basically leaves me with a choice between the Cheapo plan and the Health Savings plan. The Cheapo plan would be less expensive in most cases but we could end up with a very substantial bill if we run into high medical costs in any given year. The Health Savings plan would cost a bit more on any given year but our total maximum costs are much less. Given this comparison I think the Health Savings plan is the better option for our situation and risk tolerance of my wife and myself. The plan would cost us $3,828 to $9,828 per year depending on actual health care costs. Since the plan is using a Health Savings Account (HSA) some of that spending would be tax sheltered. 3. Once you've got the short list of best options, then compare the minimum, medium and maximum out of pocket costs. 4. Pick your preferred plan. Your costs are then the range of the minimum and maximum costs. Bottom Line: The cost of health insurance is a highly variable thing that depends on your situation and your needs. To find out the cost you have to do some research and decide what kind of coverage will work for you. Food prices in Vegas have been gradually going up over the years. It used to be that most places offered dirt cheap just to get you into their casino. But nowadays the casinos make a hefty profit off of their dining operations. Eating when you travel can be pretty pricey since you're often stuck eating out. Vegas isn't as cheap as it used to be, but you can still find some pretty good deals on food. Note: All prices are current as of writing and are likely to change in the future. 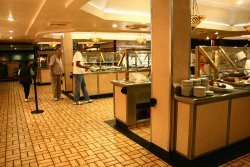 All you can eat buffets are a mainstay in Vegas and can be found at most every major casino hotel. Prices vary widely from around $10 at the low end to about $40. Vegas.com has a list of buffets. The buffets can be a very good deal for a meal as they offer a wide selection of food at a pretty reasonable price. 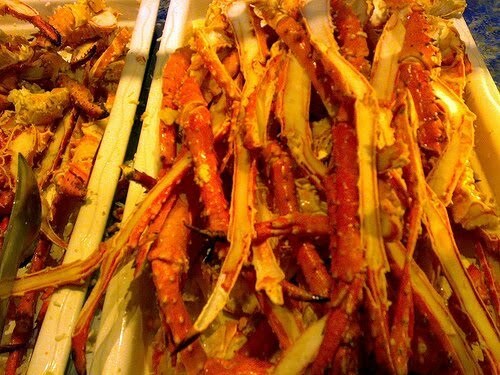 I'm particularly fond of the buffets that have crab legs. The quality of food at Vegas buffets runs the whole spectrum from mediocre to fabulous. The Buffet at the Golden Nugget has seafood for $21 and I've also been generally happy with the More buffet at Luxor which is $20 for dinner. If you want to splurge then the Bellagio buffet is very good but its around $30-35. Taking the all you can eat idea one step further some buffets have recently started selling a ticket for all-day dining that gives you access to their buffet all day long for breakfast, lunch and dinner. The RoundTable Buffet at Excalibur or the More Buffet at Luxor both currently have an all-day long price of $29.99. The Circus buffet at Circus Circus is $25 for adults or $20 for kids. If you aren't satisfied with unlimited food all day at a single buffet then you can get unlimited all day dining at seven buffets for one price. Right now several of the major strip hotels are offering a deal called the 'Buffet of Buffets'. This is a one price deal that lets you eat at any of 7 different buffets. Buffets included are : Paris, Planet Hollywood, Flamingo, Harrah's, Caesar's Palace, Imperial Palace and Rio. Currently it costs $34.99 for rewards members or $39.99 for non members. The Buffet of Buffet's is an easy way to get a lot more variety than just getting an all-day buffet pass at a single buffet. It is a long tradition for Vegas casinos to offer deeply discounted food prices to entice gamblers into their casino. While this isn't as common as it once was there are still many casinos offering great bargains on food to tempt you into their establishment. There are numerous deals on meals at the casinos and hotels around Las Vegas. The major destination hotels on the strip are less likely to have great food deals. 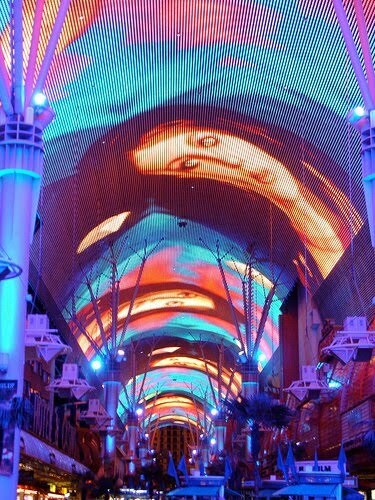 You're more likely to find such discounts at the off strip and downtown casinos. The Vegas.com website has a list of food specials. You can find breakfast deals for $2-4 at half a dozen spots, shrimp cocktails or hot dogs for $1-3 at several places, steak or prime rib dinners for $7-10 currently at nine restaurants. If you manage it and plan your eating right you could get a $2 breakfast, $1 hot dog for lunch and a $7 steak dinner and eat for about $10. The major drawback to these deep discount deals are the travel involved. If you don't have a rental car then that much travel will cost you more than you'll save making it impractical. Even if you do have a rental car the amount of time spent driving around time will cut into your vacation fun time. You can also find some recommended cheap eats at CheapoVegas.com. Vegas hotels will periodically offer specials where you can get promotional credits or discounts when you book your hotel reservation. Food credit good for use in their restaurants and buffet are one of the things they sometimes offer. For example the Palace Station is currently offering a hotel package with 2 free breakfast buffets per day. 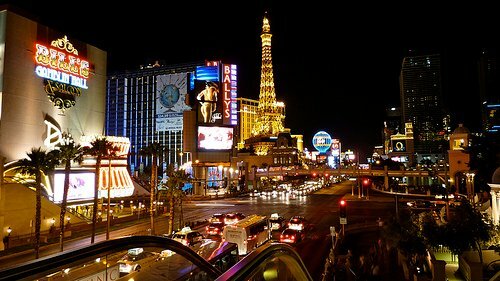 There are a number of discount coupon deals offered by hotels and casinos in Vegas. Its fairly common to get discounts on dining through these coupon offers. When we checked into our hotel on our last trip to Vegas we were handed a sheet of coupons including at few for discounts at the hotels restaurants. For example the Sahara has a special currently offering a coupon book when you book with them which has $200 worth of discounts on food and entertainment at their hotel. The Harrahs hotels are currently offering a coupon book which has discounts on shows plus : "$5 off half a dozen Buffets, and lots of dining discounts and free drinks" But be warned, take the advertised value of this kind of discount packages with a grain of salt. If they advertise a large discount total dollar value like "$900 in discounts" since that really means a lot of 2-for-1 show tickets and 20% off coupons that are worth "up to" a total of $900 if you were to use all of them. You can use discount gift certificates from Restaurant.com at several Vegas locations. The restaurants in Mandalay Bay take the coupons. These might work if you want to eat at one of the restaurants in question. But you have to get the gift certificate in advance, you have to generally spend a minimum amount and a 18-20% gratuity is often mandatory. It might be a good way to get $25 off a $75 meal at a high end place, but its not a super bargain in general. Cheap food isn't a very good deal if the food is poor quality. Some of the buffet's in Vegas may have very cheap prices but the food isn't very good. To help identify the poor quality dining and buffets in Vegas you can do a little research online first. Yelp.com has user reviews on restaurants and buffets in Vegas. If you go to Yelp.com and search for 'buffets' in Las Vegas you can sort the list and add filters for price. For example I did a quick search for 'buffet' in 'las vegas nv' and then filtered for Las Vegas itself, '$$' price level and 'buffets' category. The 3rd option there is the Garden Court Buffet at Main Street station with 4 out of 5 stars average from 39 reviews. On the other hand the Sahara Buffet only has 2 stars average. You can also view the list of reviews for restaurants at Tripadvisor.com and then sort their list based on price and filter it to show buffets or other options. Eating out at restaurants is more expensive in general than cooking your food at home. If you rent a condo or motel unit with some cooking facilities then you can save a lot on food by preparing your meals at home in your own kitchen. You don't have to cook everything in your room, simply having a box of cereal and a half gallon of milk in a mini-fridge can save you a lot on breakfasts. Major downside for this strategy is that most hotels in vegas do not have any kitchen facilities in room even minifridges or microwaves and most don't even have a coffee maker. And of course it can take time away from your vacation fun to prepare your own meals. This is a good way to save on in between meal snacks or water. Simply dropping by a grocery store at some point to get yourself some snack food and bottled water can save you a fair amount versus the prices you might pay for such things on the strip. You may have heard of 'comps' in Vegas where the casino gives free stuff to gamblers. If you do much gambling then you can get yourself free things from the hotels and casinos. Let me be clear : I would NOT recommend gambling just to get the rewards, but if you're gambling for entertainment anyway then you may as well get the free comps. This doesn't work very well for me since I never gamble that much. But if you are a gambler then you should take advantage of the gambling comps you may be offered. Casinos usually have a club card of some sort that will track your gambling and get you free stuff based on a reward system. When you sign up for the casino club card you can often get some free discount coupons as well. You may have to gamble a LOT in order to get comps of any significant value. For example the Grazie club would take 2500 slot points in order to get a $10 gift card which means you'd be gambling $2500 on slot machines to get $10 free product. Bottom Line : There are a zillion different food options in Vegas with everything from $1 hot dogs to $40 buffets. If you do a little research in advance and take advantage of deals you can keep your costs down and get some very good food. 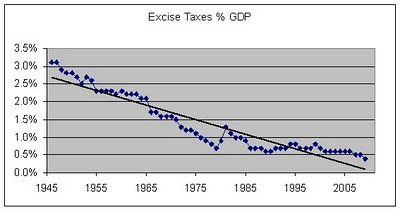 Previously I talked about the History of Taxes as % of GDP. 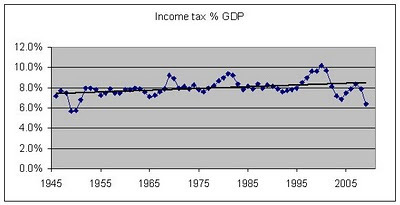 In that article I showed two graphs showing the personal income tax as % of GDP and the corporate tax as % of GDP. I decided to revisit that topic and show more graphs. I like graphs. 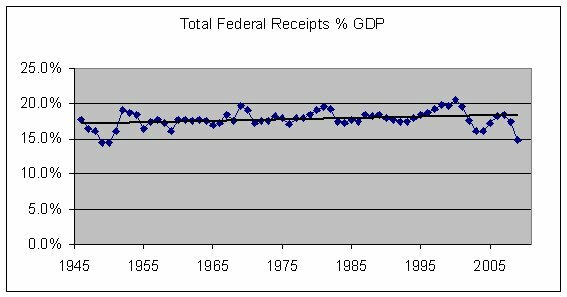 The Government Printing Office (GPO) has data online for the budget of the US government showing historical details in tables. 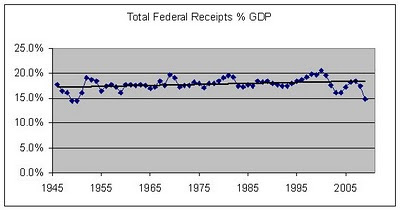 In the 2011 FY budget tables in table 2.3 they list receipts by source as % of GDP from 1934 to 2015. I made the graphs below using that data as is. I decided to show just the period from 1946 to 2009. Before 1946 the situation was a lot different given the depression and then WWII. The numbers for 2010 to 2015 are just projections so I'm not showing those. Since the numbers are represented as a % of the GDP then they will go up and down based on the changes in the GDP. If tax rates remain the same but the economy is really strong one year then GDP will go up and the % of taxes as GDP will be lower as a result. Its important to keep in mind that these figures are a reflection of the taxes relative to GDP but not a direct picture of tax policy. Of course these figures are only for federal taxes and do not cover state or local taxes. 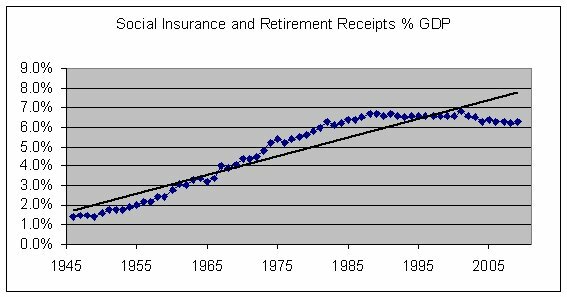 The total tax receipts as % of GDP has bounced up and down a bit over the decades but the long term trend line for that period is pretty flat. The average and mean rate was 17.8%, the low was 14.4% in 1950 and the high was 20.6% in 2000. Personal income taxes are the taxes that get the most visibility when talking about federal taxes. 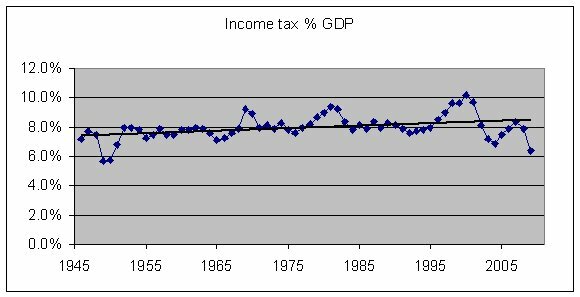 The trend in the amount of personal income tax as % of GDP has been surprisingly flat from 1946 to 2009. As you can see the % amount bounces up and down from year to year but the overall trendline is only slightly tilted upward. The average was 8.0% and the median 7.9%. The low was 5.7% in 1949 and the high was 10.2% in 2000. Excise taxes used to be more significant but from 1946 to today they steadily dropped from around 3.1% to 0.4% in 2009. 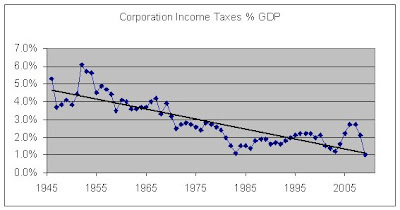 Corporate taxes as % of GDP have been on a gradually went down from 1946 to about 1980. 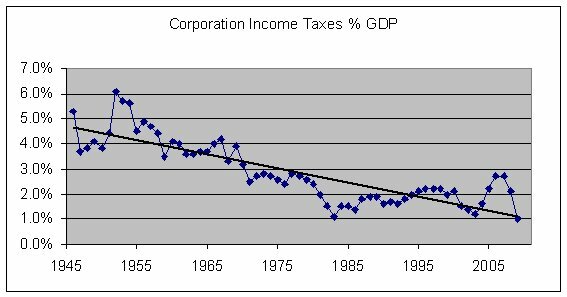 In 1952 the corporate taxes were about 6.1% of GDP but by 1983 they'd dropped to 1.1%. From the 80's to 2009 the rate fluctuated a bit within the range of 1.0% to 2.7%. Some of the fluctuation in the tax rate is due to the performance of businesses rather than changes in tax policy. So for example if the economy is bad then companies don't make as much money and therefore pay less taxes as a result. 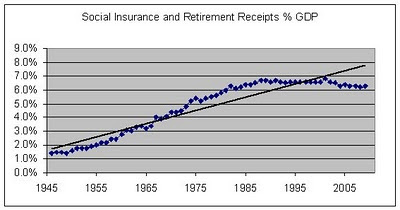 You can see there was a pretty steep upward trend from 1946 to around 1985. It started at a just 1.4% of GDP and then ramped up to 6% by 1981. But from the 80's onward it has held relatively flat between 6-7% range.